Big tandem boards will be on hand and tandem surfing specialist Fred and Aurelie will be here to advise local surfers on the ancient and romantic art of tandem surfing, where couples grace the surf together on a single board. It will be a chance for the local surfers to introduce their sometime reluctant girlfriends or wifes to their beloved sport. It will also be an opportunity to honor the legendary Hawaiian Olympic swimmer Duke Kahanamoku who is credited to have introduced the sport of surfing to Australia in February 1915 at Freshwater. It is a little known fact that during the surfing exhibition he performed there, he tandem surfed with a young local girl name Isabel Letham who thus became the first Australian to ride a wave on a surfboard! Even though there was no love interest between Duke and Isabel, tandem surfing has historically often been about love: it became very popular in the 1920's among the Waikiki Beach Boys who wanted to â€œget friendly withâ€� the visiting tourist girls, and today, Hawaiians often keep a tandem board in their quiver to go surfing with their loved one, spouse or children. It is said that Hawaiian waterman Laird Hamilton won the heart of his now wife, star volleyball player Gabriella Riece, by taking her tandem surfing! The expert tandem surfers will perform several free exhibitions for all do enjoy throughout the week-end. 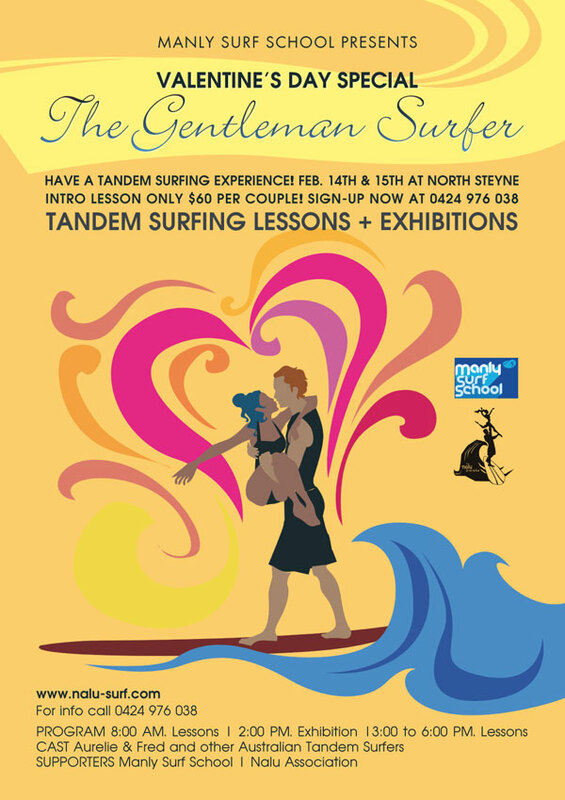 If you want to signed up for the Tandem Workshops, please call Manly Surf School at 9977 6977 to reserve. Beach Sign-Ups through the week end are also possible. Cost is $60 instead of $90; it includes one and a half hour of private coaching and the hiring of the equipment. Manly Surf school is Located at the North Steyne Surf Lifesaving Club.